Staining wood is one of the cornerstones of finishing. We not only offer a wide selection of stains to choose from, but in some cases we are the manufacturer, so we can offer unsurpassed technical advice. 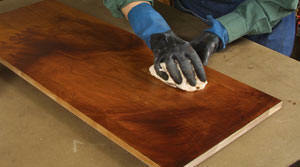 Pigment stains enrich the natural texture of wood, while dye stains bring out depth, figure and color. Concentrated colorants are added to paints, stains, glazes, paste wood fillers and other materials. Pre-Mixed stains are ready to use products that require no special mixing. Choose from Dye-based or Pigment Based. Colorants are pure colors that can be added to finishing products or thinned and used as a stain. Colorants that are dye based can be used simply by reducing with the appropriate thinner. Pigment colorants typically have to be added to a finishing product.